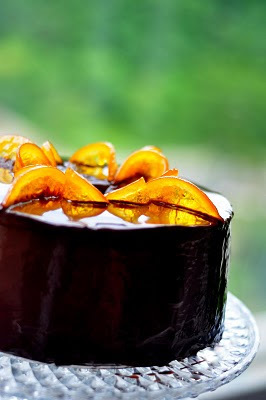 My first step, which I did the day before, was to make some candied orange slices for decorating the cake. Making candied orange is an amazingly simple process, requiring little skill but much patience for boiling, rinsing and re-boiling the orange slices several times to get rid of the bitterness of the orange skin, and to render the orange slices soft. 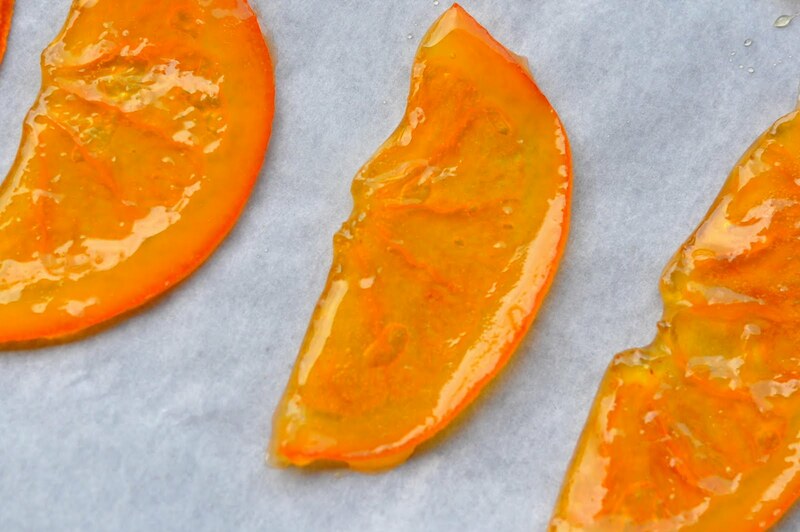 Unfortunately I am somewhat lacking in the patience department, and did not reboil the slices as often as I should have, resulting in candied orange slices that were rather chewy. Apart from that, they turned out beautifully luminous and glassy - holding one was like holding a little piece of sunshine. 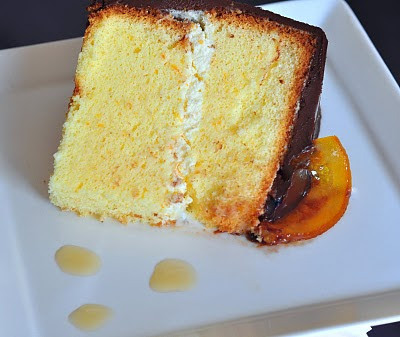 Next, I made the chiffon cake (recipe from Rose Levy Beranbaum) - adding in orange juice and orange zest in abundance. I couldn't decide whether adding in some orange chunks would give the cake nice, interesting orangey pulp parts, or render parts of it soggy instead. Since this was for an event, I decided to reserve my experiment with orange pulp for another time. The cake rose beautifully high, and was a lovely natural orange colour - I liked the fact that it tasted good on its own without even adding any orange extract! I split the chiffon into 2 layers, and whipped up a simple fresh cream frosting with orange zest and orange Cointreau to go between the layers. 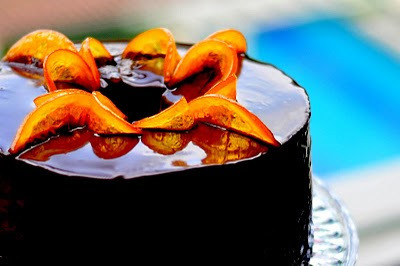 Since orange and chocolate is such a well-loved pairing, I glazed the entire cake with a generous covering of Valrhona Alpaco 66% dark chocolate, flavoured again with orange cointreau and orange extract. I had intended at first to lay the candied orange slices flat on the top of the cake, but somehow that resulted in them looking very dull against the dark chocolate background, which really didn't do justice to how amazing they looked on their own (as you can see). In the end, after a couple of experiments, I decided to stand them up in a fleur-de-lis type arrangement so as to show off the stained-glass luminousness of the candied oranges. I liked how the cake looked when it all came together, and even better how it tasted. I served it for supper with some honey orange sauce on the side (made from boiling the oranges) as well as some chocolate sauce. It received rave reviews from my friends, with all of them (and myself too!) going for seconds. The candied oranges were a hit, and the orange cream went beautifully with the fresh lightness of the orange chiffon. The only thing is, I definitely should have cut down on the amount of chocolate that went in the glaze. In my determined attempt to both finish up my chocolate as well as to render the sides of the cake smooth, I slathered too much chocolate glaze on the cake - there must have been 3 coats! And the problem with that is that it rather over-powered the lightness of the orange chiffon. For future reference, a thin pouring of chocolate glaze would be just perfect. 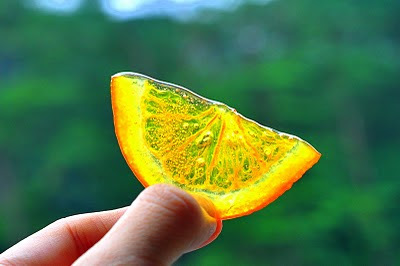 All in all though, it turned out to be a satisfyingly delicious effort, and has made me even more enamoured of oranges. Next up, stay tuned for a 'white' version of this, for quite a different, lighter effect. that looks divine! adding it to my list or recipes to try! Ho.ly. Cow! Wow! I want that in my belly! Stunning! Nice shot. Wish I could dive right in! Wow, this is great. I like it. The flavor and the decoration was very nice. Keep it up.